Each time, it's become a little more complicated, mostly do to the electronic gadgets that I bring along. I didn't have a cell phone, iPod (and speakers) or laptop computer when I was tent camping, but now I can't seem to do without these toys. The problem is that ALL of these gadgets need electrical power of some kind and all have rechargeable batteries which always seem to be running down. This tendency to bring along every modern electronic gadget is called "flash camping" in high tech new-speak. All of these toys can recharge from a cigarette lighter or from a 110 VAC inverter plugged into a cigarette lighter. However, the power still has to come from somewhere and ultimately that somewhere is the alternator in my truck, usually via the truck battery. Dry camping in a trailer without a generator means that everything electrical in the trailer runs from the trailer domestic batteries. Those batteries need to be recharged after a few days as well, either from the truck while the trailer is being towed or from shore power when available. The loads in the trailer itself are significant enough for the domestic batteries. Adding the recharge loads of all of these toys is just too much. I need those trailer batteries for domestic functions so another way is needed to recharge the toys. This page describes that other way that I use to keep the toys charged. Batteries are rated in amp-hours. This is the product of the current available multiplied by time. A typical small RV battery is capable of supplying 40 amp-hours. This means that it can supply 1 amp for 40 hours, 10 amps for 4 hours or 40 amps for 1 hour. The more current that is drawn, the quicker the battery goes dead. This is a table of the loads in my trailer. Other RVs should be similar. Single 12 volt lamp 1-2 can easily be the largest total draw because several can be running at once and they can be on for hours, especially if camping in the winter when sunlight is lost early. Propane detector 0.1 - 0.2 all RVs that use propane are required to have them. They can amount to a significant load because, if used at all, they are on ALL of the time. Large RV loads, such as an electrically powered refrigerator or A/C typically run only from shore power. A refrigerator usually won't even work from a battery except to run the igniter when it is running from propane. However, SOME RV refrigerators CAN be set to run from +12 volts. These do draw significant power and can flatten a very large RV battery in a jiffy. If the trailer batteries run down due to overuse, they must be recharged from the tow vehicle or the lights, pump and refrigerator igniter and other necessary goodies stop working. Recharging the trailer batteries from the regular trailer umbilical can take hours. This is ok if you are traveling anyway, but once you've reached your destination, your tow and trailer will seldom be connected. Even connecting the tow directly to the trailer battery with a set of jumper cables (to get a higher charge rate) means that the tow has to sit and idle for an hour or more to get another couple of days worth of juice into the domestic batteries. I have two domestic batteries for the trailer. Normally, multiple batteries will be wired in parallel so that they charge and discharge together. However, I have installed cutoff switches on both of them so that I usually only keep one connected at a time. The switch on the nearest battery is in the open state. This way, I get a pretty solid indication when half of my capacity is consumed. I'll only close the switch to a battery that needs charging so that only that one gets charged. If you connect a charged and discharged battery together, one will inefficiently try to recharge the other. The purple stuff all over the contacts is a spray on protective coating that helps prevent corrosion of the battery contacts. I got it at Pep Boys. Recharging all my toys (especially computers) from the tow battery means that I run the risk of running down the tow battery so that it won't start. Recharging this stuff from the trailer domestic batteries can leave me without lights or water. This is bad. After several years of flattening batteries, I've iterated to a solution. I keep a THIRD full sized RV battery in the back of the tow. I've built an adaptor that allows me to recharge the extra battery from a cigarette lighter while driving anywhere. This battery then has the capacity to recharge a computer several times without running the risk of running down the tow vehicle battery. 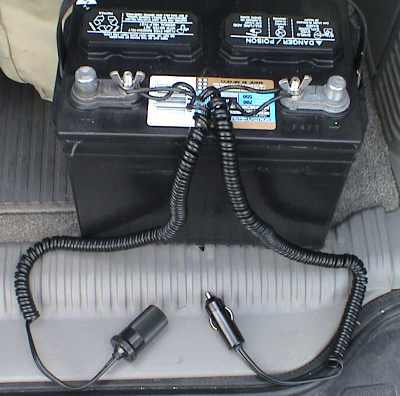 Further, if the tow does need a jump, it is easy to pull the extra battery out of the back of the tow and connect it to the regular battery with jumper cables (provided that it has not been flattened already by recharging computers). Further, if I do run down both trailer domestic batteries, I can always swap one out (because I selected the same type of battery) and recharge the formally dead trailer battery while I am out sightseeing and the trailer is left in the campsite. 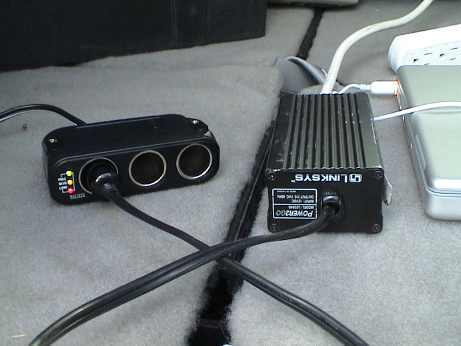 With the modification described below, the extra battery can be plugged back into the cigarette lighter socket in the trailer to backfeed power to the trailer without removing the regular batteries. The regular batteries should be disconnected before this is done however, or the extra battery will try to charge the dead trailer batteries too. If one camps in RV parks all the time, all this is unnecessary as there is access to shore power, but in National Park, National Forest, state or local campgrounds, shore power just isn't provided. While camping, I usually drive somewhere to go sightseeing every day so that I have an opportunity to recharge the extra battery. The extra battery can be left plugged in most of the time. All I need to do is to remember to unplug it when I want to recharge something so that the tow vehicle battery doesn't supply part of the load too. The basic setup is very simple. All that is needed is a 12 volt cigarette lighter extension cable and a pocket knife. The cable can be purchased at many RV stores for about $10. To make the modification, simply strip about 1" of insulation from both wires somewhere near the middle of the cable. Then wrap the stripped wires around the screw battery posts of the spare RV battery. 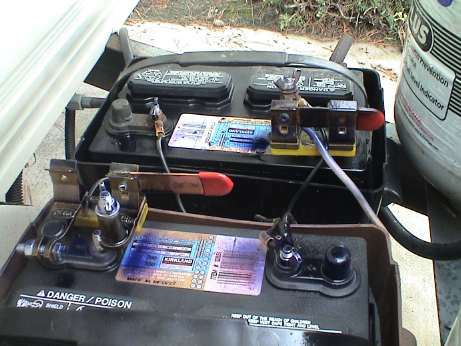 Unlike car batteries, RV batteries typically come with conventional round top posts and a screw on connection. Polarity IS VERY IMPORTANT. If it is wrong, a lot of smoke will appear very quickly. Either use a ohmmeter to trace out the wires or disassemble one end to trace the wires. The center contact of the plug or socket goes to the post marked +. If available, use a voltmeter to check to see that +12 is available on the center contacts of the plug an socket BEFORE anything gets plugged in. While the adaptor is not in use, plug them together to "safe" them and prevent a short circuit at the plug end. The plug can then be inserted into a cigarette lighter socket to allow the battery to charge. A 12 volt load can be plugged into the socket end. Both ends can be used at the same time while driving. Then the battery just floats and the load will run from the tow vehicle's alternator. However, if the socket end is heavily loaded while being charged from the plug end, the net charge rate will be materially reduced due to the voltage drop in the wiring caused by the load. My truck has 3 jacks on the dash and one more in the back. I typically recharge the RV battery from the rear jack and connect the other equipment to be charged to the ones on the dash. This way, the load being charged doesn't drag down the charging voltage applied to the battery. In the center of this photo is a conventional 150 watt inverter. This device converts the +12 volts from a car's electrical system to 110 VAC to run small loads like battery chargers. These devices are normally pretty efficient and waste maybe 5 to 10% of the input power to heat. On the left is a three way multiple power jack adaptor. This allows more than one 12 volt load to be plugged in at one time. This particular one has some handy little LEDs on it that indicate the voltage of battery. If your car or truck doesn't have multiple jacks, then this kind of gadget can come in handy. All inverters are NOT the same. They come in many power ratings. You want an inverter that has only a only little excess capacity beyond what will be required. This one has a lot of excess capacity, it is rated at 400 watts. The upside of high capacity is that you can power lots of loads. The downside is that when you do that, you will flatten a battery pretty fast. 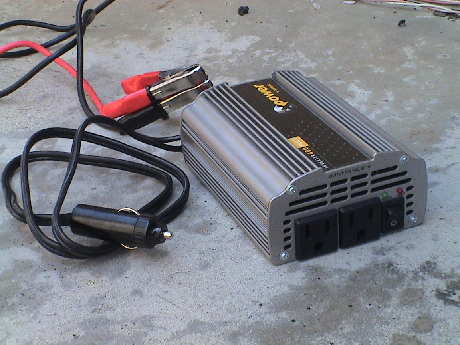 Inverters this large are more suited to use in a vehicle while the engine is running. Larger inverters are also best run from a direct connection to a battery. This one has terminals on the back where the power cords can be changed from a cigarette lighter plug to one with battery clips. Most cigarette lighters are fused at 15 amps or so. If you tried to draw 400 watts from one, the inverter would try to draw 40 amps or so and would blow the vehicle fuse in a heartbeat. Also, the wiring to the cigarette lighter may have considerable voltage drop even at a 150 watt load, maybe as much as 2 volts. This results in wasted energy and may cause the inverter to shut down due to undervoltage at it's input. Another issue with larger inverters is that they tend to draw more "overhead" current when not loaded. The 400 watt one draws 200 mA which is actually pretty respectable for an inverter that large. The 150 watt inverter above is worse, it draws 300 mA. This little one is rated at only 75 watts, enough to charge a computer and not much else. However, it's overhead current is only 30 mA. This may not seem important, but the overhead current is being drawn IN ADDITION to the loaded current all the time. If you regularly charge small loads, such as USB devices, cellphones or an iPod or iPad, the overhead current can be larger than the loaded current. Even a computer's charge current drops way off at the end of a full charge. High overhead current is a problem because it is there for the entire 3 or 4 hour charge. Overhead current is not often specified an inverter's packaging. You have to cut and try. When charging a computer, it is best from an energy usage point of view, to charge it for maybe and hour or 90 minutes and get half to 2/3 of the charge before you take it off charge. The computer won't run as long until the next time in needs charging, but the overall energy usage will be lower due to the lack of overhead currents while the charge rate would be low. You may also find that you'll have an opportunity to fully charge it from a running vehicle before it needs charging again anyway. For those of you that are electrically inclined, this little gadget is very handy. 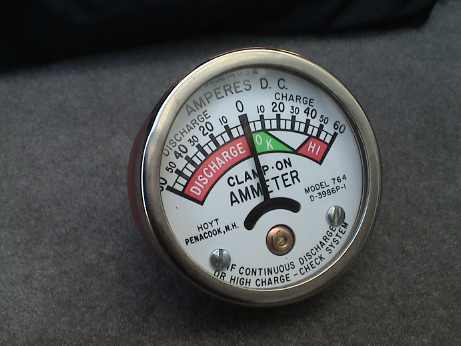 It is a clip on ammeter that can indicate pretty high currents, up to 60 amps. For diagnosing generator, or battery problems this guy is very useful. Just place the wire in question across the back of the meter and the meter will indicate the magnitude and direction of the current in the wire. It's not very sensitive or accurate, but it is sure better than guessing. I looked around for 30 years from the first time that I saw one of these before I found where to buy one. The are available from Hoyt in Penacook, N.H. The model number is 764. This is another handy gadget. 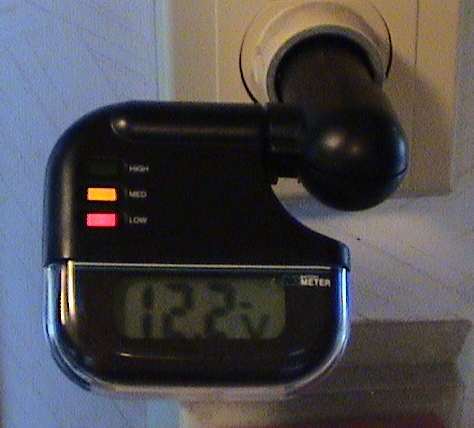 It is simply a DC voltmeter configured to plug in a cigarette lighter socket. It can be used in either the trailer or the tow to check system voltage. These can be found at RV supply stores. With all my toys hooked up and charging I've got quite a load. I will be typically charging 3 laptops (not more than one at a time), 2 cell phones, AA batteries for my speakers, my iPod and my camcorder batteries and an iPad, all at the same time while driving. By the time that I get to my next destination, all of these batteries are charged AND the spare RV battery is charged too, ready to recharge these goodies whenever needed. Most small inverters are good for 100 to 150 watts. Two laptops can exceed that load and trip off the inverter or blow it's fuse (usually located INSIDE the 12 volt plug). The smaller USB stuff can charge from many USB sources, but there are some restrictions. Various methods of charging USB devices and various USB charging sources are described at my USB Charging Tips page. When trailer batteries need a charge after camping for a week or more without shore power and without moving, the only source is again the alternator in my truck. However, just plugging the trailer power umbilical cord into the truck and idling the truck doesn't produce the best results. The parasitic resistance of the wiring is too high to allow a rapid partial recharge. Instead, I use a conventional set of jumper cables to connect directly to one or both batteries and idle the truck for a half hour or so. When the battery voltage is low, down to 11 volts or so, the differential voltage between the truck's electrical system and the trailer batteries is high enough to allow a significant amount of charge current to flow until the battery voltage picks up. I can expect 30 amps or so for a few minutes. Unfortunately, this high charging current won't continue and the charge current will decrease steadily over time until it will get down to less than 10 amps. At this point, I stop charging as I have a couple of days, at least, of power back in the batteries. Idling the truck engine is extremely inefficient and unless I am really cramming current into the batteries, it isn't worth the energy expended. It is better to wait until the batteries are nearly discharged again and give them another partial charge every other day or so. 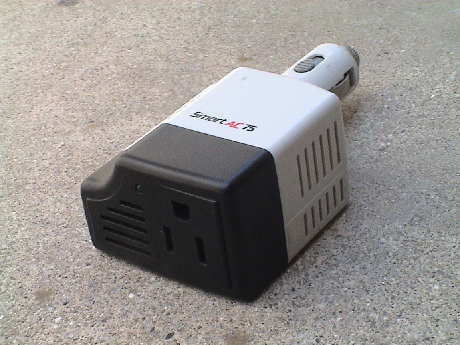 The next time we move to a new location or camp with shore power available, we can charge the batteries completely. One good way to reduce the load on trailer batteries is to replace the incandescent lighting with high intensity LED lighting. 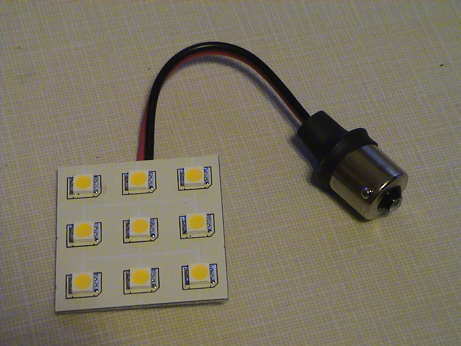 This assembly (p/n 1156-PCB-WWHP9) from SuperBrightLEDs.com is as bright as a standard RV lamp and it plugs right in the socket in place of a bulb. It doesn't produce the same total light as the bulb radiates in all directions and this device has a tighter beam, but it is bright enough over a wide enough angle to be quite useful. It costs $21.95 but it also draws only 10% of the DC power. Since lighting is typically the heaviest load on the domestic battery, this significant reduction can materially improve the life of the domestic batteries. The device runs cool enough so that it can just sit on the plastic cover on most RV lamp fixtures.